Are children getting enough direct experience with natural materials? There has been an interesting discussion going on among the middle and high school science teachers on the NSTA General Science email list about the lack of direct experience in their students’ background. Some have suggested that early childhood and elementary schools are not laying the groundwork for the later learning. I know grasshoppers from a childhood field—with two visible bulbous eyes, pincher-like mouthparts, barbs on the hind legs, and wings that you don’t notice until one goes zooming past you. And they spit tobacco! At least that is what we called the “partially digested food material along with some semi-toxic compounds from the insect’s crop region.” It stained our palms when we held a grasshopper too tightly. Have your students had that experience? Children are fascinated with beetles and other small animals. I’ll share this comment with the early childhood teachers I work with to let them know how vital the experiences they make happen, or take advantage of, are to their students’ future learning. It may inspire us to take walking fieldtrips to a nearby field or brush at the edge of a parking lot to look for wildlife, or encourage them to keep a container of Tenebrio beetles (mealworms) in the classroom. 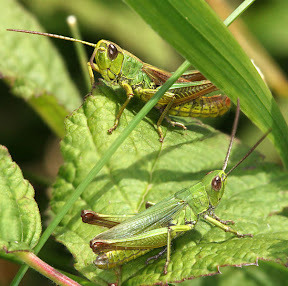 A few crickets are still chirping and crawling under leaves in my neighborhood but I rarely see grasshoppers. Time to create a small habitat so students can bring a cricket inside for a week! 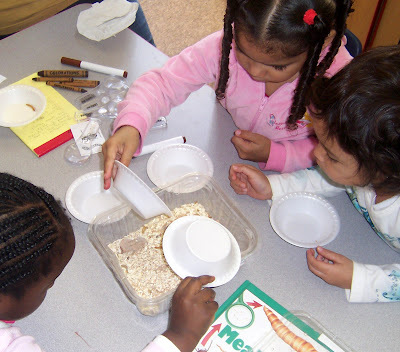 This entry was posted in Early Years and tagged activity ideas, animals, early childhood, insects, nature of materials, standards. Bookmark the permalink. Trackbacks are closed, but you can post a comment. Alexis, I agree that science may be neglected. By reading aloud to my preschoolers, and having them include some writing (their name or first letter, some nonalphabetaic or “scribble-scrabble” writing) when they do a drawing during a science activity, I hope to let students, teachers,and parents know that writing and science go together. I haven’t thought about grasshopper “tobacco juice” since my childhood! That’s what we called it, too. This lack of outdoor exposure is rampant nationwide, I fear. Author Richard Louv calls children’s lack of nature experiences Nature Deficit Disorder in his book, “Last Child in the Woods.” Louv quotes a fifth grader in San Diego who said, “I like to play indoors better ’cause that’s where all the electrical outlets are.” We early childhood teachers can make an important contribution by making nature approachable AND weaving in math, literacy and language. In my preschool class, for example, we’ve been learning about spiders because children are fascinated by the giant spider web and spider decorations for Halloween. When children find a spider outside at school they often want to kill it (as they’ve seen their parents do). So, we read lots of non-fiction and fiction books to learn how spiders are really useful creatures who eat pesky flies and mosquitoes. We go on a spider hunt to see where we might find spiders. The dynamics of the hunt change children’s perceptions dramatically. Instead of being frightened because a spider has surprised them, they are excited when they find one. They are more in control. (Of course we have to be familiar with the few spiders who bite people and advise children to look with their eyes and not put their hand into an area they cannot see.) Then we can create a graph of where children find spiders and webs. We also work in literacy and language by making up new verses to “The Itsy Bitsy Spider,” such as “The great big tarantula” and the “Teeny tiny spiderling.” And the children love acting out Little Miss Muffet, especially when it’s their turn to be the spider. I’m glad you brought up this topic, Peggy. I will have to agree. Our schools focuses more on the books and theories without really considering the application part. I believe kids should be exposed more on the outside world. I’m pretty sure it will be so much more fun and efficient for the kid’s education.